Revenue in the Toys, Hobby & DIY segment amounts to US$151m in 2019. Revenue is expected to show an annual growth rate (CAGR 2019-2023) of 12.6%, resulting in a market volume of US$243m by 2023. The market's largest segment is DIY, Garden & Pets with a market volume of US$49m in 2019. In global comparison, most revenue is generated in United States (US$168,392m in 2019). The eCommerce market segment Toys, Hobby & DIY includes the online trade of toys, babyware (inclusive of baby food and clothing), sport, outdoor, DIY and garden products (e.g. sports equipment, outdoor equipment, flowers, plants, tools, DIY products), as well as hobby & stationery articles (e.g. art/collectors’ items, car parts and adult entertainment products). Digitally distributed services (see: eServices), digitally distributed goods in B2B markets and the digital purchase or resale of used, defective or repaired goods (reCommerce and C2C) are not included. All monetary figures refer to the annual gross revenue and do not factor in shipping costs. Reading Support Revenue in the Toys, Hobby & DIY segment amounts to US$151m in 2019. Reading Support The Toys, Hobby & DIY segment is expected to show a revenue growth of 19.2% in 2020. Reading Support In the DIY, Garden & Pets segment, the number of users is expected to amount to 6.4m by 2023. 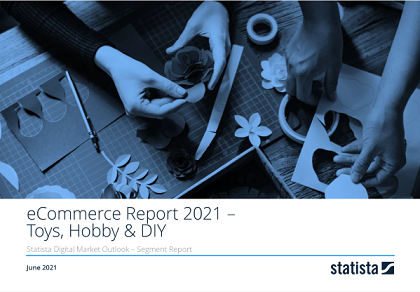 Reading Support User penetration in the Toys, Hobby & DIY segment is at 45.2% in 2019. Reading Support The average revenue per user (ARPU) in the DIY, Garden & Pets segment amounts to US$9.55 in 2019. Reading Support With a market volume of US$168,392m in 2019, most revenue is generated in United States. Reading Support In the year 2017 a share of 38.2% of users is 25-34 years old. Reading Support In the year 2017 a share of 50.3% of users is male. Reading Support In the year 2017 a share of 43.0% of users is in the high income group. Here you can find more studies and statistics about "Toys, Hobby & DIY".